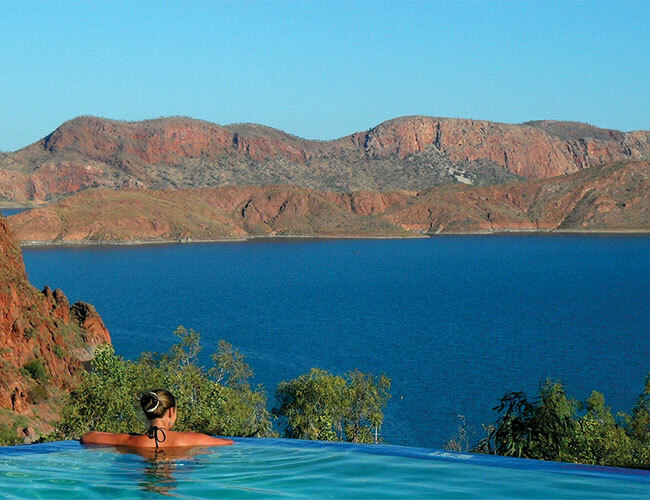 With over 18 times the volume of water in Sydney Harbour, Lake Argyle is a sight to behold. This expansive man-made body of water is the largest of its kind in Australia and home to an extraordinary ecosystem. A swim in the local camp ground’s infinity pool overlooking this vast water world is simply delightful! 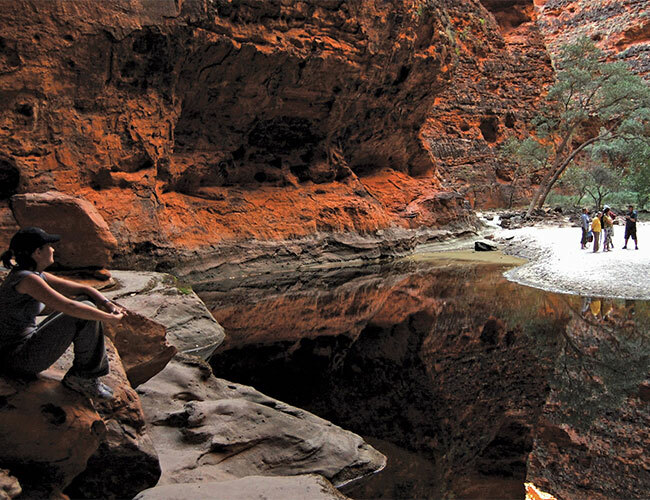 In the heart of Purnululu National Park, trek into the midst of the Bungle Bungle domes, to discover the grandeur of Cathedral Gorge. While the red cliff walls of this remarkable natural amphitheatre tower above, we recommend you lay back on the white sand and contemplate the meaning of life. 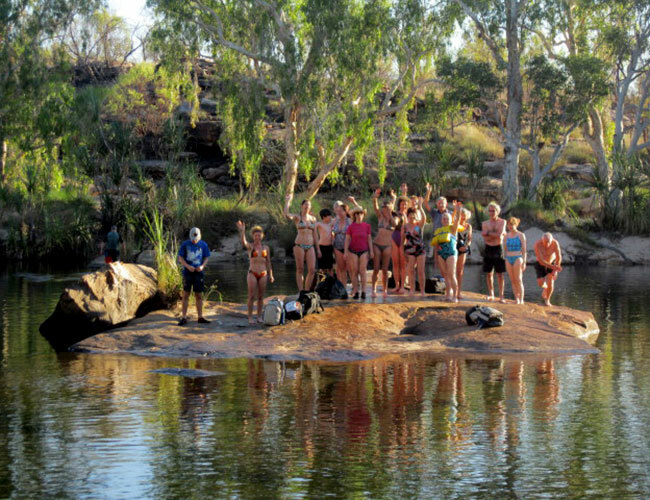 The trek into Manning Falls is one of our favourites: Across the river (in water up to your waist or jump in the tinny on a rope) from our private camp, we trek across the plains, over rocky outcrops and through outback woodland to reach the outback oasis of Manning Gorge. Climb down into the gorge, hop across the stepping stones then dive in right in, off the rocky shelf. The large cool pool is the perfect reward as fresh water tumbles over the cliffs above you. Bliss! 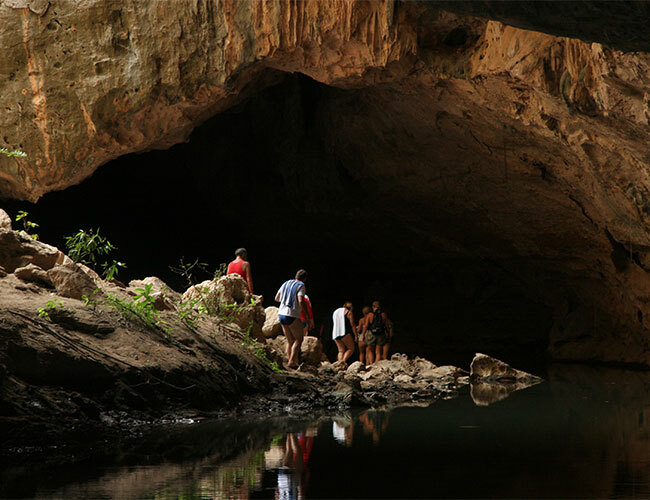 Tunnel Creek played such an important role in Bunuba history that exploring this remarkable waterway with a local indigenous guide provides not only an adventure, but an insight into the story of Jandamarra from the perspective of his own people. Jump on board a high-speed vessel and power into the Buccaneer Archipelago. The awesome power of the ocean is on display as the Kimberley’s famous Giant Tide surges through the Sunday Island group. 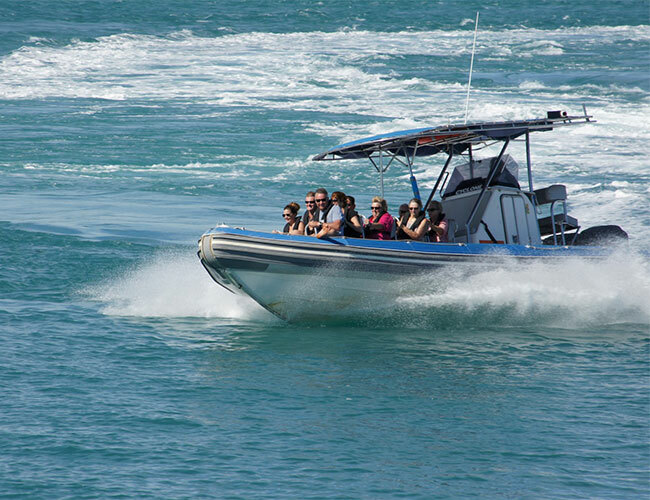 Witness standing waves, giant whirlpools and emerging reefs: a Kimberley coastal experience that is not to be missed! Combine the Kimberley icons with our TOP FIVE on our 12 Day Kimberley Explorer, the best value adventure tour in the Kimberley. Inspired to go wild in the Kimberley? Want to Go Wild in the Kimberley?